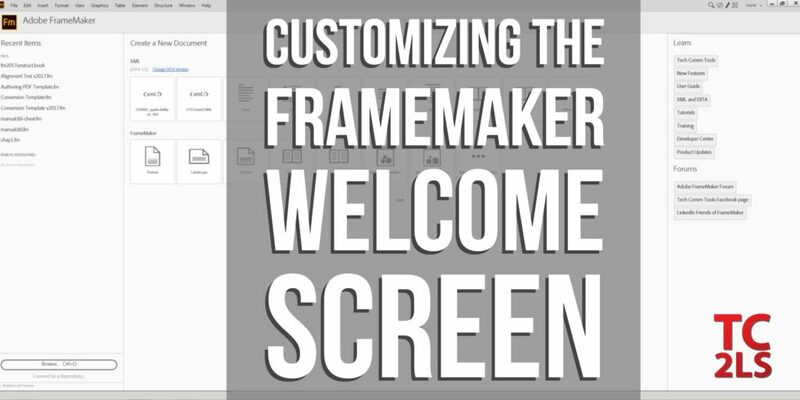 Did you know you can fully customize the FrameMaker welcome screen? It’s easy with some basic HTML and CSS. But even if coding web pages isn’t your jam, you can still make some quick welcome screen changes just by swapping out a few files in your FrameMaker directories. See the end of this post for more information. Customizing the FrameMaker welcome screen is a new feature to Fm 2017, and even though I knew the feature was there I’d not actually customized my own welcome screen until now. You might be asking yourself: Why do I want to do this? Well, the welcome screen is an HTML page, so if you want to remove things (like the rotating banners) or add things like links to web resources (adobe forums, the Tech Comm Tools facebook communities, or anything, really) this is a great way to make use of the real estate visible in FrameMaker when you have no open documents. As you can see, I removed the Adobe announcements panels, and with a little HTML and CSS editing I made the buttons stack in a skinnier column. I also slightly adjusted the left column values to give more space to the center column. Here’s a video walkthrough of the files, the locations, and some of the minor changes I made. If you’re going to try this on your own, make sure to keep backups of your originals! Here are the directories (by Fm version) for the html and css files you need to modify. For FrameMaker 14.0.1 or later, replace the files in the %appdata%\Adobe\FrameMaker\14\resources\welcomeScreen\ directory. 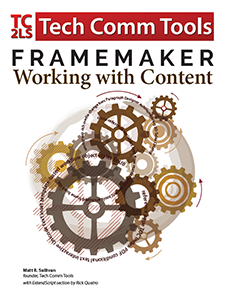 Now you just have to restart FrameMaker and you should be done! If you don’t have the time or inclination to start mucking with HTML and CSS code, you can still easily get rid of those scrolling banners…just fill out the form at the end of this post and I’ll send you a link to download my modified files. It takes less than 5 minutes to fill out the form, download the files, and replace your scrolling welcome screen with the screen I used in the video. If you have any questions (other than how to write HTML and CSS…) give me a shout. 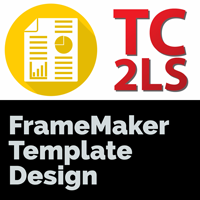 Join the free Tech Comm Tools community and I'll send you what you need to customize your FrameMaker welcome screen in under 5 minutes. Success! Now check your email for details.